One of the tree houses that has been shaped from an old fishing vessel. THE first thing you will notice when you arrive in Pantai Redang, Sekinchan, is the number of tree houses peeking out from the gaps amidst the foliage. These structures were pieced together by the villagers, using driftwood and bits and pieces of timber salvaged from old fishing boats. According to a trader, the tree houses were originally built for the villagers to relax in and enjoy the breathtaking tranquility of the beach in the evenings. The structures also served as a playground of sorts for the children. However, they soon began to attract visitors who stopped by at Pantai Redang, soon popularised through social media. Today, Pantai Redang is a bustling tourist spot, especially among seafood lovers who stretch their legs here after having had their fill in the fishing town. Busloads of visitors can be seen swooping down what used to be a barren strip of sandy beach. This has, in turn, sparked off economic activities among the more enterprising locals. They have set up base underneath the trees, some just below the tree houses, selling anything from tidbits and kites to simple meals and drinks. 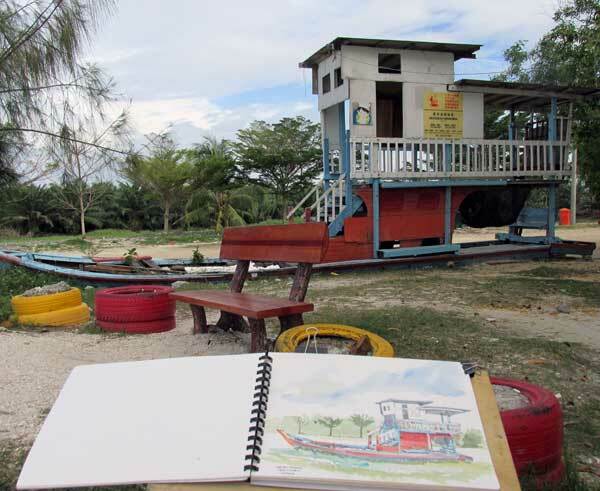 I did a piece of one of the play structures crafted from the shell of an abandoned fishing boat beside a hawker stall. Shortly after I finished, a drizzle drove me to seek refuge under a tree house to paint another scenery, that of the hawker stalls under the trees. Behind me was a stretch of mangrove swamp. 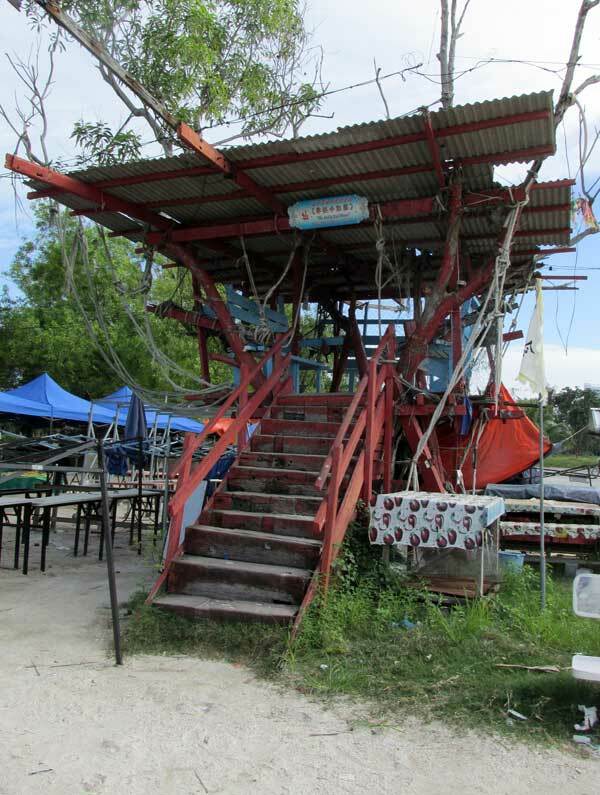 The tree-houses are popular with visitors to Pantai Redang. As I was about to finish, I was alerted to the presence of another group of visitors, that of the feathered kind. 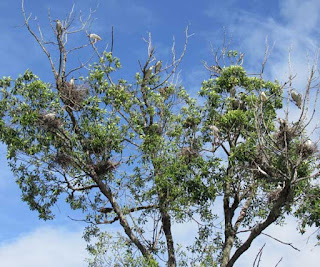 My presence had startled a school of nesting grey herons, and some other seabird, and they objected with raucous cries. Some took flight only to return to their nest to keep an eye on me. I do not remember seeing any the last time I was there. A local told me that these birds were mostly local species that can be seen around mangrove swamps and estuaries. Once a year, they gather along Pantai Redang to build their nests and mate, foraging for leftovers from the fish landing jetties or stealing a crumb or two from uncovered trashbins. 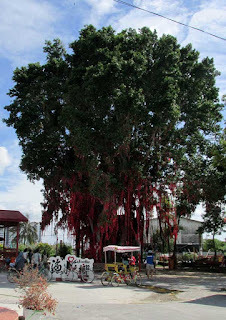 Pantai Redang’s star attraction is perhaps the “red” tree beside the Chinese temple. It has appeared in many social media posts as a background subject in selfies, sparking similar replicas in coastal enclaves that are trying to attract tourists. This red tree literally holds hundreds of handwritten wish streamers on its branches. To make a wish, one writes what one desires on a strip of red ribbon and hurls the streamer into the branches. If the ribbons are caught by a branch, the wishes will soon be granted. If it is not, you just throw it back until the tree accepts it. Another place of interest in Pantai Redang is a factory producing salted fish located just behind the temple. If you are lucky, you can catch sight of workers preparing fish to be salted. However, ask for permission first before entering the premises. PANTAI Redang is located in the coastal side of Sekinchan town. As you reach the village side of Sekinchan from the Kuala Selangor main, turn right at the T-junction into Jalan Bagan. Half a kilometre from here, you will cross a small river with fishing boats moored to your left. Turn left immediately after this road into Jalan 12. Pantai Redang is located about 1km from this point. There are signboards all the way, but chances are you will spot some tour buses and vans heading in the same direction or coming out. Be alert for lorries carrying fish as well as villagers riding their bicycles or motorcycles without helmets. This popular spot is also registered on Waze and you can search using Pantai Redang, Sekinchan. There are also many seafood restaurants along the way from the town right up to Pantai Redang.